ALF Service, company specializing in communications, set design and lighting for large events, for conventions and product launches as well as for annual meetings or sales meetings provides a new corporate event lighting service. 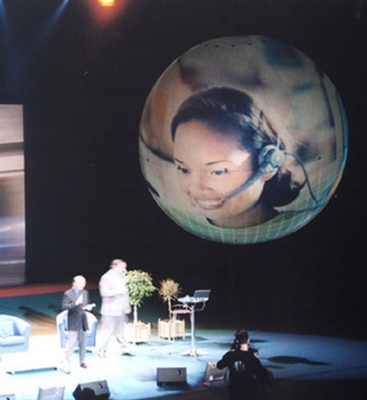 Photos and video footage can be reproduced through the revolutionary Sphere Projection system, which allows the projection of images on a 180° surface without distortion, thanks to a special software positioned within a 5-metre diameter sphere. Needless to say, there are many spectacular and imaginative implications of these projections. Just think of the effect that can be created by an image projected on a spherical surface, with adequate lighting, supported at various heights over the ground floor of a location. Spectacle and memorability are guaranteed. ALF provided many events with this technology: the MTV Music Awards in Rome, the MTV Days, and the concerts of Sting, Ligabue and Coca Cola Live; the Convention Sales Meetings & Product Launches of Cartier, Coca Cola, DHL, Ebel, Ernst & Young, Mercedes, Nestlé, Vodafone and L'Oreal; the fashion events of Hugo Boss, Corneliani, Moncler and Classico Italia; the Cannes Cine Festival parties, the Genoa International Boat show gala dinner and the Venice Cine Festival; and, among the sports events, the endurance world championships, the America’s Cup, the Goal 4 Africa and the Golf Non-Stop tournaments. With a talented staff of experienced designers, ALF Service gives technical support to the event agencies to make as effective as possible the communication within their meetings, providing solutions using up to date cutting edge technology.